So far, this year has been amazing! I have ridden twice since the new year and both lessons have been truly incredible. The first ride of the year, I got to jump the highest I have ever jumped--20 inches. The second lesson, Peppy and I worked on some dressage and went on a trail ride afterwards. But mostly, out of these two lessons, I've spent hours of bonding time with my best friend. We have known each other for nearly two years and we do have a strong bond but I've been really working on making it even stronger and my goal this year is to build an incredible bond with Peppy and him to trust me more than anything. I've been doing different things with him in the pasture--hand grazing him, lots of grooming and petting and talking to him while I do other things around the barn such as cleaning the tack and sweeping the barn aisle after picking out Peppy's hooves. My trainer even let me do some free jumping with him after my lesson last week. It was amazing! We didn't go very high. They were only set at 2 feet but it was so much fun and an incredible bonding experience. I can't wait to get back to the barn to spend time with my baby and this year has truly been the start of something good. I'm very excited to see what the rest of 2017 has in store for me and my four-legged partner. Two years together... Thank you! Peppy, two years ago a little light came into my life. It seized my heart, my thoughts and my dreams. This little light was you. I remember the first time I met you like it was only seconds ago. It was love at first sight. After I went home from the barn that day, I remember that feeling I had in my heart. It was a feeling I had never ever felt before. Every time I thought about you I would smile and that feeling would come back, it still does to this day. 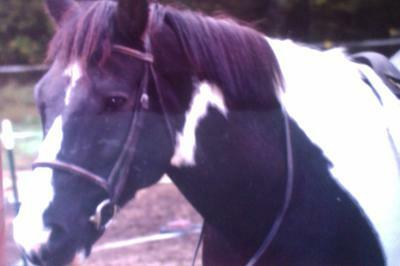 That first year I rode you taught me so many things although I rode you very few times. You are such a willing learner and teacher. I could never have asked for a better partner than you. This last year, we have grown so much together as a team. Our bond has grown to be incredible to the point you choose me over food and your friends in the pasture. You follow me without a halter or lead and you listen to me better than anyone else. I'm looking forward to the rest of this year to grow as a rider, a friend, and to have you by my side no matter what. You truly are the best thing that EVER happened to me. Simply and with my whole heart, thank you! I love you Peppy! You will always be My Little Classy Star... With lots of love and peppermints, you deserve a big hug and a huge THANK YOU! I may hold the reins... But you hold my heart... See you soon buddy. Love you tough guy! This is just a little something I threw together for the one and only Peppy! I take no credit for the two songs and the soulmate thing. All credits to writers and people who wrote/sang the songs! ***What's a soulmate? It's like a best friend but more. It's the one person that knows you better than anyone else, that someone who makes you a better person. No, actually they don't make you a better person, you do that by yourself because they inspire you. This is a tiny little story about what I think he sees in his eyes when I go out for a lesson. He always comes to the pasture when he sees my car and he knows which day I'm coming. I know horses can't detect days but they can go off of routine and I always ride on Wednesdays every other week. Hope y'all enjoy! Day after day, children come and take me from my pasture and lead me to the barn. Some smother me in kisses and carrots, others pretend I don't exist. But one young girl in particular I look forward to coming. It's a warm, sunny morning and I'm out in the pasture with my friends. But when I see a large gray suburban coming down the road, my heart pounds. I break into a trot and stop by the fence, waiting for my girl to come down. A moment later, a young girl of thirteen hurries down to the pasture. Her brown eyes dancing, her brunette hair bouncing, with a smile on her face. "Good morning Peppy! I missed you so much"! She says as she feeds me a peppermint. My favorite treat in the whole world. She comes into the pasture and throws her arm around my neck. I nuzzle her shoulder and chuckle a low nicker. "Let's go get you ready, handsome boy." She whispers to me and places the halter and lead on me. She lays the lead rope on my neck and I follow her up to the barn not trying to get away. My girl tells me everything. Her deepest secrets, about the things she's done, vacations and parties. But she also tells me none of it was as special as the three hours every two weeks she spent with me. There is something special to me about her. Maybe the calm way she acts around me, how she loves and respects me. She's been with me for two long years and I wouldn't have it any other way. I hope i will be able to! I hope I will be able to post the poems! That is so nice of Tango's owner! On my last lesson, I only got to see Warlock but I hope I can ride him soon! Oh, the poems you wrote about Tango and Peppy are so sweet! Yes, please do post them! The owner of Tango gave me a horsehair bracelet from Tango's mane and his nameplate from his stall. She knew I loved him dearly although he was boarder. Have fun with Warlock! I'm also writing a poem about another horse Dusty, who passed away about 3 years ago... Maybe I can post it with the other poems I'm writing about Warlock. Thanks for the advice! And yes, I always do as much as I possibly can with him. Thank you! And I'm so glad for you and Warlock! I do that with Peppy too, lol. I would love to see poems! And I will keep writing them! I miss Tango so much. Much more than I could ever think. It really really hurts. I remember when I lost Quincy but I didn't know her as well as I knew Tango. I never realised how much I love him until he was gone. It hurts. Anyway, what I'm trying to say is don't take your time with your horse for granted because they can be taken from you when you least expect it. I never saw it coming but it happened. It hurts. RIP lovely horse. I love you and I'll see you again one day, I promise. One last time... goodbye Tango. I know how you feel... My stable had to put down a beautiful palomino gelding. We even had a funeral for him... he is that special to all of us. Please read my story, it's called Runaway. Warlock already breathes back when I breath into his nose! I'm sure I'm the only one who does it to him because I once did it and his face really looked like he recognized me! I'm also writing poems about him... like the ones you do about Peppy! Please post more of your poems! They're awesome! I recently found out that one of my favorite horses Tango, was put down. He had developed founder and there was no way to fix the problem. He was an amazing horse. He was a flea bitten grey Arabian gelding with the most luxurious mane I have ever seen. I miss him terribly. I have never ridden him but I have always stopped by his stall to pat him and feed him carrots. He was such a sweet, loving horse. I've had to say goodbye to so many horses lately. First, it was my first love Quincy then Charlie, a beloved lesson horse, then it was Ted, a sweet rescue who I fell in love with and miss so much and now its Tango. Charlie and Ted were sold but I will never see them again most likely. Thank you! I LOVE PEPPY TOO! Lol. Well, if the horse you want is anything like my baby then I know he must be perfect! Good luck with saving for him! I love Peppy!!! He reminds me SO much of the horse I am saving up for! I love the name Warlock! So cute! I'm glad he's trusting you! Keep it up and you will have an amazing friend by your side! I went out to the barn yesterday just to see him! He followed from the pasture to the barn without a lead or halter or even a treat! I've been working with him on that forever! Good luck! Warlock, (my fave horse) has been doing some of these things and I have done a lot with him! Thanks so much! Please post your progress with Peppy! I would love to hear it! Thanks! And for tips for bonding, just spend as much possible time with him/her. Groom them, give em treats (Peppy will do anything for a peppermint), find out where they like to be scratched or brush and treat them to a massage. LOL. Ride them as much as you can and talk to them. If he lifts his head up and watches you when you go to catch him from the pasture or stall or even comes to you, you're already halfway there! This is Awesome! Can you give me some bonding tips to do with my favourite horse?